The accumulation of fat under the chin, known as a ‘double chin’, or ‘submental fat’ often accompanies the ageing process. However ‘double chins’ can also be a result of genetics or lifestyle. The layer of subcutaneous fat around the neck that sags down and creates a wrinkle. This tissue is very resistant to diet and exercise and therefore difficult to get rid of. Slack necks and heavy chins can be noticeable. For some, it’s the first thing people see – so it’s a common cause for concern. A recent study in the US concluded 7.2 million people in the US are ‘very bothered’ by their ‘double chin’. 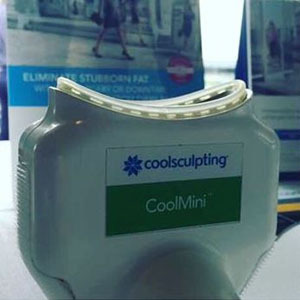 The CoolMini CoolSculpting applicator provides a solution to double chins and submental fat. 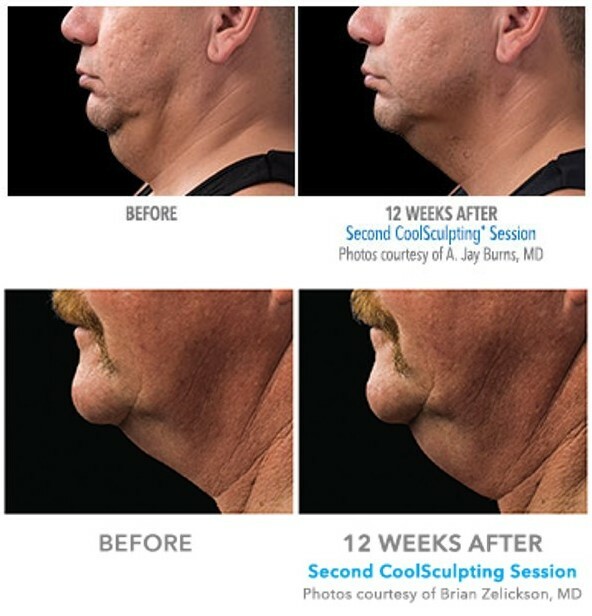 The CoolSculpting chin procedure is safe, effective and FDA-cleared. The applicator’s size, shape and curvature is specifically designed to fit underneath the chin. The procedure is non-invasive and with no needles, knives or risk of infection. Our experienced and certified CoolSculpting practitioners at Injector 5280 first want to understand the precise areas of the submental region that bothers you. We will collectively map out a targeted area to ensure we address your individual concerns and end-goals. Once you are sitting comfortably, our practitioners will carefully and strategically position the CoolSculpting applicator. Cooling begins which starts the process of inducing fat cells to die. Fats cells will naturally be eliminated from your body. This provides a steady and even reduction of submental fat in the treatment area. The treatment takes about 60 minutes and you can resume normal activities immediately. CoolSculpting does not harm or damage the surrounding tissue. The best part – it’s non-invasive with often little to no downtime. The results are very predictable and effective. Some patients reach their desired outcome after just one treatment, while others may need multiple treatments. We will advise you on how many treatments you’ll need. A reduction in fat around the neck allows the chin to return to a tauter appearance. We have also seen lifting to the neck, as well as residual skin tightening (individual results may vary). Because results are gradual, the treatment can remain totally private. The CoolSculpting chin procedure is entirely non-invasive and therefore patients can resume normal activities immediately after treatment. CoolSculpting for the chin is a safe alternative to liposuction and other invasive neck contouring procedures. Patients experience little to no discomfort. It’s never been easier to transform your body without surgery! Injector 5280 is a Denver CoolSculpting Certified Practice, offering affordable and cost effective treatments with an upfront pricing policy. CoolSculpting for the chin is a very affordable, nonsurgical treatment for patients who want to eliminate their ‘double chin’. Every patient is unique, so we encourage patients to come in for a complimentary consultation. Our CoolSculpting experts will be able to advise if you are a candidate. As part of your complimentary consultation we will answer all of your questions and concerns, and thoroughly map out a customized treatment plan for you. If you are frustrated with a double chin and stubborn far under the neck, call us today. Book an appointment at Injector 5280 with our certified and experienced CoolSculpting practitioners.